…was a black tee and a red skirt from Loehmanns. High heels. Pearls. My mother-in-law was giving a lunch. This was at the top bit of Scotland, so far north that time of year, June, the sun’s up at 3 and hangs around til midnight. It’s the same latitude as Oslo and Gothenberg, places where summer is the crazy season – heavy drinking, hard partying, everyone a little wild after a winter of darkness. But not up in Scotland, not at my mother-in-law’s house. This was a decorous, formal affair, two damask-covered tables in the conservatory and a lot of silver flashing in the sun. We would be starting with sherry, moving on to wine with the salmon and finishing with a sticky. My mother-in-law had drawn up a placement, which was hanging on the kitchen wall. 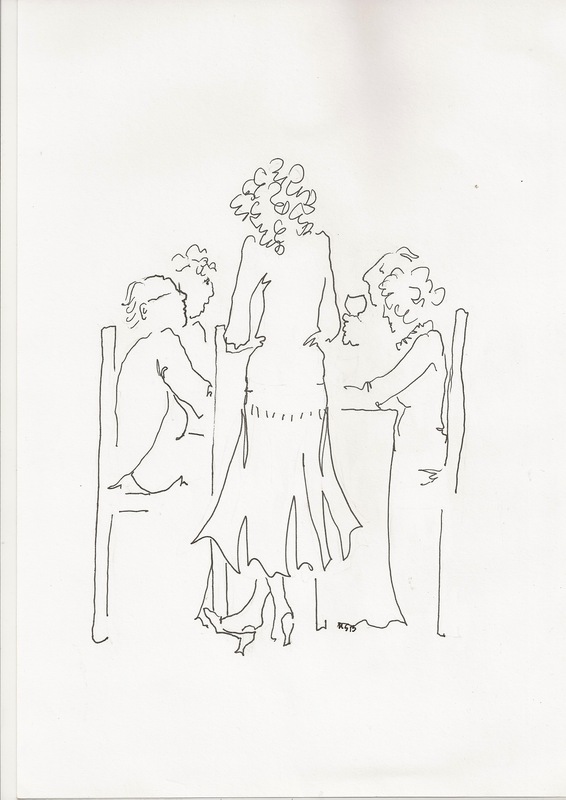 I was seated at the head of one table; she reigned over the other. We took our places and ate our lunch. The pudding plates were being cleared away when my father-in-law brought in two dusty looking bottles of port. This was a catalyst for a certain amount of genteel commotion; the men pushed their chairs back from the tables, unbuttoning their jackets and the women sat up a little straighter in their chairs, lifting their heads with bird-like pertness. Across the room, my mother-in-law nodded at me. I responded with a smile of collusion: Yes, my smile said, it’s been a successful lunch. Surprisingly, she did not smile back. Instead, she nodded again, more emphatically this time and made an impatient gesture with her hand – a sharp wave in the direction of the door. I gave her my What? face and then the light bulb went on again over my head: she was telling me to lead the women – the ladies – out to the drawing room. It was time for us to withdraw, to let the men commune and drink their port. This was what my role as adjunct hostess came down to, this moment as lunch wrangler. It made me oddly agitated. One part of me was saying, yelling almost inside my head: I grew up in New Jersey! I was born in Hicksville, Long Island, for heavens’ sake! Women don’t slink out to the drawing room in New Jersey. Men don’t swig port in Hicksville. And what is a drawing room, anyway? But another part of me was going, O, get over yourself. Stop being such a reverse snob. There were books in New Jersey. You’ve read your Jane Austen and your George Eliot. You’ve seen this on TV. And I’ll bet somewhere in New Jersey, maybe even in Hicksville, Long Island off Route 25A, ladies withdraw while men puff cigars and lie about golf. These thoughts swirling around my head, I stood to attention in my red skirt from Loehmanns’ basement. My hands gripping the chair rail, I said in my throatiest voice to the room at large: Ladies. Shall we?